Today’s post is a repost from Jimmy Davis’ blog, Cruciform Life. Many of you may be struggling this holiday season. You long for the joy of Christmas, but life’s burdens are wearing you down. Maybe you’ve lost a loved one and this is your first Christmas without them. Maybe you’re fighting illness, or a plummetting bank account. Whatever your struggle is, God sees you. He loves you and He’s promised to be your Abba Daddy. Yep, here I am again. In one of those “rock and hard place” seasons, wondering how to be refreshed in the desert. And then I was reminded today that God and I have had this discussion before. So here it is, from my old blog over three years ago. Reading this encouraged me to keep my eyes on Jesus, even and especially when I’m feeling “stuck.” A good reminder during Holy Week. I often feel caught between a rock and a hard place. In fact, some weeks it seems that I merely step from one rock to another hard place, wondering when the tough times will pass so that I can experience those “times of refreshment from the Lord” (Acts 3:20). But God promises to refresh me in and from those places. Strange. I don’t know that I’ve often expected refreshment in, and especially not from, hard circumstances, difficult relationships, or the agony of waiting. A couple of days ago I was feeling caught in one of those “rock and hard place” days. I came back to the office after lunch, feeling the anxiety building up inside, and was reminded to pray my midday Psalm. The scheduled Psalm was 114 which highlights the power of God as it was displayed through the wilderness wanderings of His people after the Exodus. Talk about some hard places! The Psalm concludes with these verses: “Tremble, O earth, at the presence of the Lord, at the presence of the God of Jacob, who turns the rock into a pool of water, the flint into a spring of water” (vv. 7-8). The psalmist is most likely alluding to those moments when God’s people found themselves on “thirsty ground where there was no water” (Deuteronomy 8:15). The people complained to Moses, Moses cried out to God, and God provided fresh water from the side of a rock (Exodus 17:1-7; Numbers 20:2-13). As I meditated on these verses the Spirit seemed to be saying, “You don’t have to wait until the hard times are past to find refreshment. I can satisfy your thirsty heart from the rock and in the hard place. When I am present in those places (and I Am), you can find refreshment for your soul.” I was then reminded that just the week before He had me meditating on Exodus 17:1-7, the time God told Moses to strike the rock and watch the water flow. God told Moses in verse 6, “Behold, I will stand before you there on the rock at Horeb, and you shall strike the rock, and water shall come out of it, and the people will drink.” The key to the rock providing water was not the pounding of Moses’ staff but the presence of the Standing God. JIMMY DAVIS loves being married to Christine, with whom he shares the adventure of raising three great kids and a Havanese pup named Charlie. Jimmy earned an M. A. in Christian Education and M. A. in Biblical Studies from Dallas Theological Seminary, and is an ordained teaching elder in the Presbyterian Church in America. In over 20 years of ministry he has served as a pastor to youth and college students, youth-ministry consultant, church planter, pastor of discipleship, and has taught Bible courses on the high school and college levels. 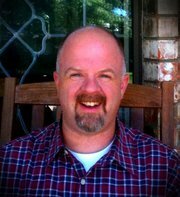 He has also served as a staff writer and associate editor of the Colson Center’s Worldview Church Website, and maintains The Cruciform Life Blog at www.cruciformlife.org. 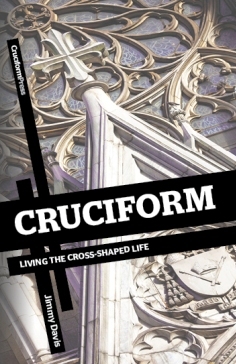 Jimmy’s first book Cruciform: Living the Cross-Shaped Life was published by Cruciform Press in April 2011. “What is the Cross-Shaped Life? It is the vertical life of loving God with all your head, heart, and hands; and the horizontal life of loving others as Christ has loved you. Employing the symbols of the cruciform cathedral and the Celtic cross, Jimmy Davis uses personal stories, both humorous and heart-breaking, to encourage and equip the reader to gain a cross-shaped perspective on how he or she can be an active participant in God’s community-on-mission. Remember, if you loved today’s post and would like to see it in the top 3 of 2011, FB share it, “like” it, tweet it, or leave a comment. This entry was posted in Faith, God's Authors, Kisses from God and tagged Christ, Cruciform, Jimmy Davis, Moses, times of refreshing, water from the rock. Bookmark the permalink.